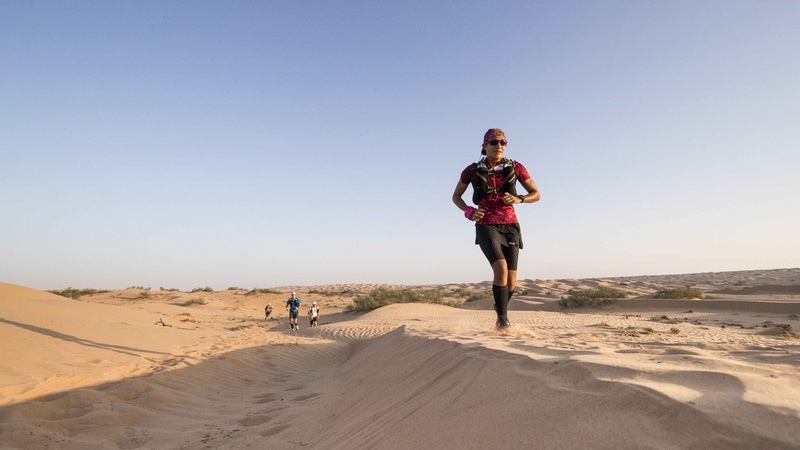 UTMB International, the international division of the world-renowned Ultra-Trail du Mont-Blanc (UTMB), has got its first international race underway – OMAN by UTMB – in the Middle Eastern county of Oman. Today, more than 450 runners from 56 countries departed the start line with eyes and feet set on the challenging 137km – 85 mile – mountain course that lies ahead. The race also signifies the starting line for UTMB International, as the European-based ultra-trail race producer sets its sights on expanding the UTMB brand around the world. Described by UTMB Mont-Blanc Race Director Michel Poletti as “a must-do race”, OMAN by UTMB has been designed to produce a challenging course that will ‘immerse the runners in the natural beauty of Oman’s dramatic interior’. At the race’s heart is the 2,200m high Jebel Akhdar – the Green Mountain – along with deep wadis, ridges, ancient villages and desert landscapes in a unique Arabian environment. The involvement of local communities along the course and the creation of a long-term legacy has been an objective from the start. The race utilizes sections of trail based on traditional village to village pathways. This is an aspect of cultural immersion that the race organizers worked closely with local groups to plan. Over the last few weeks, teams have been out running and checking the route to ensure that the inaugural Middle East event ‘delivers every element expected of the prestigious international UTMB brand.’ The response to UTMB International has reportedly been positive. Following the the announcement of OMAN by UTMB, the race organizer expanded the participant categories and race entries to meet demand. The current field includes more than 450 runners ranging in age from 21 to 70 years-old. OMAN by UTMB fields 69 local Omani runners. From the USA, Meredith Edwards, a professional athlete and UTMB regular who lives and trains in the Teton mountains of Wyoming, is expected to finish among the top female runners. UTMB International was created to help spread the influence of the world-renowned ultra-trail running race, UTMB (Ultra-Trail du Mont-Blanc), worldwide. Over the next 10 years the organization plans to work with international partners to establish major events on every continent. UTMB International works with OC Sport – the global sports marketing and events company specialising in professional sailing and outdoor events including running, trail running, amateur cycling and triathlon. Operating globally from bases in Switzerland, France, UK, United States and China, OC Sport is an award-winning event management company and rights holder. It manages competitive teams and athletes and provides consultancy to global brands, host venues and other event organisers. In 2017, OC Sport’s international team organised 28 events in 16 countries and 5 continents.